← A quick video introduction for mixOmics, vote for us! The objective of this advanced workshop is to introduce the fundamental concepts of multivariate dimension reduction methods for the integration of high-throughput biological data sets. 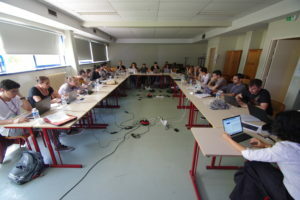 The aim of this workshop is to introduce our latest mixOmics integrative frameworks and in particular N-integration with DIABLO where several ‘omics data sets measured on the same biological samples or specimens but using different types of technological platforms (this excludes SNP and categorical data). The aim is to identify a correlated multi-‘omics molecular signature explaining a phenotype of interest. The workshop will also introduce another type of integration for cross-platform comparison and the combination of independent studies: P-integration with MINT considers independent data sets measured on the same P variables (e.g. genes) but in different studies, and generated from different labs. The aim is to identify a robust molecular signature across those independent studies (note: mostly focused on gene expression data). Organized and sponsored by: Professeurs Invites program Université d’Evry and Institute for Plant Science Saclay (IPS2). Practical information Registration fees are 200 EUR for postgraduate students, 300EUR for academics and 600 EUR for participants from the private sector. The workshop includes tuition, course material, morning and afternoon coffee breaks and lunch. Location: Institut de Sciences des Plantes – Paris-Saclay (IPS2), Gif-sur-Yvette (Parisian region), salle rouge. Registration EOI is now closed. You will be contacted to register to the workshop. Priority will be given to postgraduate students and early career researchers, with a maximum of 30 participants. Prerequisite and requirements This is a semi-advanced workshop. We require from the trainees a very good working knowledge in R programming (e.g. R is used on a weekly basis to perform data mining and statistical data analyses) as well as some experience in using basic mixOmics methods (PCA and PLS-DA with parameter tuning along with interpretation of mixOmics graphical outputs) to be able to benefit from the workshop. Participants are requested to bring their own laptop, having installed the software RStudio http://www.rstudio.com/and the R package mixOmics (instructions will be provided prior to the training). Day 1 (9am – 5pm). Day 2 (9am – 5pm). Some time for data analysis, debrief and departure.